Comfortable well equipped holiday home with access to beautiful Rennies Beach at the end of the street, 5 minute walk. Short walk to town, cafes, harbour markets and shops. Comfortable home for those in need of a relaxing seaside holiday. Collect fresh eggs every morning and if you're lucky you may even score fresh herbs in the garden. Modern kitchen with great cooking facilities and dishwasher. 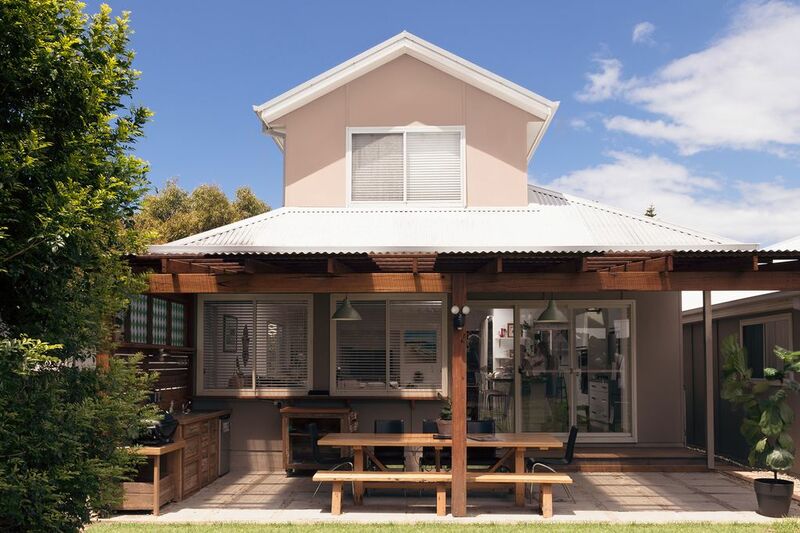 The living area backs onto the backyard which has a gorgeous new outdoor entertainment and BBQ area made from recycled hardwood and a northeast aspect creating a lovely sunny haven in the backyard. North easterly ocean breezes keep the temperature down in summer. Parent’s upstairs retreat: Queen Size bed with ensuite (shower and bath) - ocean and mountain views. ALL BED LINEN AND BATH TOWELS provided for your convenience at no extra cost. You will need your own beach towels. Five-minute walk to the Ex Servo's Club which is family friendly offering dining facilities and entertainment. A short walk to beaches, Rennies, Pockets, The Bommie and Racecourse Beach all offering great surfing, swimming and fishing. Located in Ulladulla, 3hrs south of Sydney and 2.5 hrs from Canberra, Ulladulla is renowned for its beautiful coastline, great surfing and it’s wonderful wilderness bush walks in the Budawang National Park. Please note the image of Rennies Beach on this website has been taken from the viewing platform above the beach not from this house. Beaches - Rennies, Racecourse, Pockets, The Bommie, Mollymmok, Narrawallee and Golfcourse are just some of the many beautiful beaches. Art galleries and Winerys at Milton and Bawley Point. Two golfcourses at Mollymook,five minutes away. Various native bushland reserves with cultural walking tracks in the direct vicinity of the property. Along with one of the most beautiful wilderness areas for the more enthusiastic bushwalker - The Budawang Ranges. This is our third stay and won't be our last. If you want to get away from it all and chill, there is no place like this home away-from-home. We have three children and a dog so each morning we stroll five minutes (or less) to Rennie's beach and have a good run around and paddle in the water, before breakfast. The chooks at the house laid seven eggs on the first morning and there's nothing better than fresh laid eggs to start the day. Excellent restaurants close by and Funland entertainment for the kids. See you for our winter break Therese! We had a really great family trip, including with the grandparents and grandchild, by staying at Rennies Beach House. We loved the outdoor space and had all our meals at the huge wooden outdoor table. The bedrooms were all very comfortable with queen size beds rather than bunks which seems to be the norm, and we liked the studio out the back, as well as the beautiful upstairs master bedroom. Getting fresh eggs from the chooks for breakfast was fun! You don’t need to bring anything really as its pretty much all provided for! The house could do with a bit of maintenance and the location is a tiny bit out, but otherwise great for a weekend getaway with family. Therese was lovely to deal with too. Thanks for the great time. Myself, my parents, adult children and husband spent a few days midweek at Rennies Beach House. 4 bedrooms with double beds was the perfect setup for my family. A lot of holiday rentals have bunk beds which didn’t suit us. The house is spacious and comfortable with enough room for everyone. The kitchen had enough room for 2-3 people to move around and there were more than enough pots, pans and utensils to choose from. My elderly parents appreciated the bedroom in the granny flat building so that they didn’t bother everyone when they got up through the night. There was enough parking for 3 cars in the driveway. The backyard was secure for the dogs and the undercover area was a relaxed space with a large table. We didn’t enjoy sunny weather, but could happily sit out the back watching the rain. The chickens were an added bonus. I was a little unsure about the chickens but they were entertaining to watch as they scratched around the yard and easy to get back in the coop. This was our second visit - we enjoyed staying here in the summer so came back to recharge our batteries in the winter. The house is warm, spacious and comfortable and has all the amenities you would expect, including a garden big enough for the kids and dog. Nothing beats a small walk to the dog friendly Rennie's Beach at the end of the road. It's stunningly beautiful, tranquil and we'll definitely be back! Thanks Therese, your house is wonderful. A beautiful property that comfortably met and exceeded our expectations. A perfect coastal getaway!